FILE - Free Syrian Army fighters prepare their ammunition during what they said was an offensive against forces loyal to Syria's President Bashar al-Assad in the southern city of Dara'a. Syrian opposition groups are gathering in Riyadh for the first meeting to choose their representatives for international talks on a political transition in Syria. The three-day meeting, which begins Tuesday, is hosted by Saudi Arabia. The kingdom has joined the U.S. and other world powers for two recent rounds of talks on Syria in Vienna. Saudi Arabia will lead efforts to identify moderate Syrian opposition representatives who could engage in U.N.-mediated talks with Syrian government representatives, as part of a multi-national effort to resolve Syria’s political crisis. “They will start to try to get a common set of principles around which opposition groups can unify as they begin to prepare for political discussions with the Assad regime,” said State Department spokesman John Kirby Monday. He said the government and opposition talks “hopefully” will begin early next year. The Saudi Press Agency said, “all Syrian moderate opposition segments” of “ethnic, sectarian and political spectra inside and outside of Syria” have been invited to the talks. 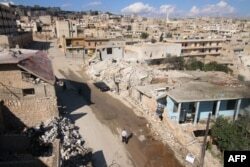 However, Syrian Kurdish factions, including the Democratic Union Party, said Monday they have not received invitations. FILE - A general view shows damaged buildings in the town of Darat Azzah, west of the northern Syrian city of Aleppo, following reported bombings by government forces, Oct. 7, 2015. In mid-November, representatives of world powers including the U.S., Russia, Iran and the United Nations wrapped up a second round of talks in Vienna on a broad plan for a political transition in Syria. They agreed to try to bring Syrian government and opposition representatives into U.N.-mediated talks by January. They also voiced support for the establishment of credible, inclusive governance in Syria within six months, and free and fair elections within 18 months. Secretary of State John Kerry said under the plan, a cease-fire could be enacted in Syria as soon as government and opposition representatives took initial steps toward the U.N.-supervised transition. However, that cease-fire would not include Islamic State or the al-Qaida-linked Jabhat al-Nusra group. While Saudi Arabia is hosting talks on identifying moderate Syrian opposition representatives, Jordan is leading a separate effort to help world powers reach a consensus on which Syrian opposition groups are considered terrorist groups and which groups are considered moderate. 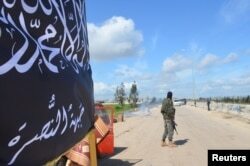 FILE - Members of al-Qaida's Nusra Front man a checkpoint in Idlib. Kirby said a follow-up meeting to the Vienna talks is expected to take place before the end of the year, possibly in New York. Also, U.N. Security Council finance ministers will convene a December 17 summit in New York to consider new international efforts to cut off revenue to Islamic State. U.S. Treasury Secretary Jack Lew will chair the meeting. “Cutting ISIL off from the international financial system and disrupting its financing are critical to effectively combating this violent terrorist group,” said Lew in a Friday statement. While oil revenue from areas in Syria that are under Islamic State control provide some funding for the terrorist group, coalition airstrikes on oil sites have significantly degraded the group’s ability to refine and smuggle oil, said a senior State Department official. In a Friday briefing, the official said that as a result of the strikes, Islamic State’s oil revenue fluctuates significantly. “I don’t want to guess the revenues. People have talked about $500 million from oil revenue a year,” said the official. The group also raises money through other means, including imposing taxes on residents in areas under its control and from selling looted antiquities.